Scarce separate issue nautical chart of Ipswich and Annisquam harbors, Massachusetts. Ipswich and Annisquam Harbors Massachusetts. A scarce 1857 nautical chart of the Ipswich and Annisquam Harbors in Massachusetts. These two important ports are located just north Boston near Cape Ann. Both were centers of for the cod fishing and whaling industries in the 18th and 19th centuries. Today they are popular tourist destinations. 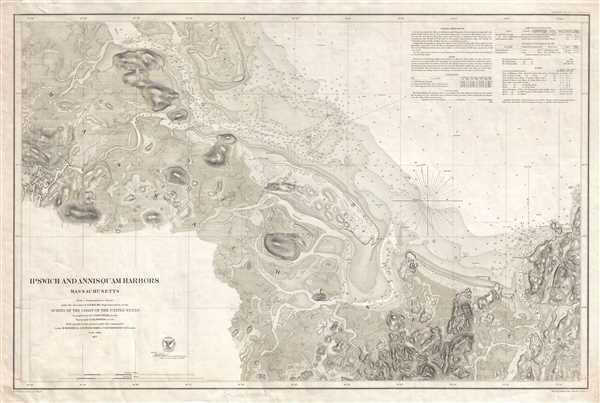 The chart itself covers from Ipswich in the west to Annisquam in the east, shows the various bays and estuaries in between. Unlike many coastal charts, this example also has significant inland detail, showing roads, towns, farms, and some topographical features. Countless depth soundings throughout. Sailing instructions and notes on tides and magnetic variation appear in the upper right quadrant. The triangulation for this nautical chart was completed by C.O. Boutelle. The Topography is the work of H. L Whiting. The hydrography was accomplished by parties under the command of M. Woodhull, S. D. Trenchard, and C. R. P. Rodgers. The whole was compiled under the supervision of A. D. Bache, one of the most influential American cartographers of the 19th century. This chart is moreover noteworthy in that it is NOT one of the more common charts issued folded into the annual Superintendent's Report, rather it is a separate issue nautical chart on thick stock. Very good. Minor overall toning. Minor foxing.